While it is relatively straightforward to grok how a conventional car works (fuel burns, moves pistons, this drives a car forward through gears and drive shafts and axles...the Volt is a touch harder if only because of its different technique. So, we've talked at a high level about how it works, now lets go a bit deeper. For well over 100 years, cars have been powered almost exclusively by burning of fossil fuel. This centers on capturing the energy of burning fuel into mechanical motion that is transferred through transmissions, drive shafts, axles, to wheels. Returning to a stop is accomplished by using plates (brake calipers), covered in a friction material (brake pads), that rub against disks or drums to slow the vehicle by turning that motion into heat. The rub here is that once fuel is burned, it quickly escapes as waste heat (radiated from the engine having done nothing to move the car or exiting through the exhaust system having only helped in the case of a turbo-charged car that reclaims that exhaust energy to boost the engine's power) or becomes motion that ultimately dies an unceremonious death as heat through the brakes or other friction (with the air, with the road through tires, or in countless other places where that energy passes on its way to move the car along). You can use the word 'efficiency' to refer to how much work is done (to move the car from point A to point B) by that burned fuel before it becomes heat in one of those many forms and is lost. So, all of the efforts to achieve 'high efficiency' in cars are exercises in increasing efficiency by doing something to get more motion out of the energy put into the system. Techniques that can be used include reducing friction. Aerodynamics reduce the friction with the air. Low rolling resistance tires reduce friction with the road. Optimizations in the moving parts of a car can reduce loss of energy through friction, either through improved lubrication or changing the types of connections to ones that might be more expensive, but lose less energy to friction. Vehicles that carry batteries and electric motors of any kind (hybrids, full electrics, and cars like the Volt) also carry out another trick - they reclaim energy of motion back into the battery through a technique known as regenerative braking. Electric motors that can propel the car reverse their function and become generators powered by the motion of the car itself. Turning that motion into electricity slows the car. The electricity is stored in batteries that then power the motors again to re-propel the car later. So, that covers some of the techniques generally used today to improve efficiency but how does a Volt work? A Volt is not exactly as a hybrid like a Toyota Prius nor a pure battery electric vehicle like a Nissan Leaf - rather it can be thought of as an electric car with an on-board generator powered by gasoline. So, how is that different than a hybrid like the Prius? A hybrid uses a gasoline engine and electric motor/battery to propel the car. At low speeds, the electric motor can propel the car by itself, but at moderate to high speeds (or when significant acceleration is needed), the gasoline engine must be engaged to assist. The efficiency gains of a hybrid occur mainly in stop and go driving when the regenerative braking and low speed electric operation combine to reclaim energy and use it again, reducing the amount of fuel that has to be burned in slow-speed operation (this also points to why hybrids typically have better mileage in city driving than on the highway - the electric propulsion either doesn't come into play on the highway or is insignificant). Also, there is added complexity that comes from having the gas engine and electric motor operating simultaneously to move the car along - both have to supply power to a common transmission that then combines the inputs and supplies a single output force to the drive wheels. Obviously this works, but it is complex. cables let the energy flow to where it's needed. A Volt, by contrast, provides drive power to the wheels through a pair of electric motors. They get their electric power from a battery pack or from the generator driven by the gas engine. In normal operation, when there is power in the battery pack, all the electricity needed to drive the Volt is coming from its battery and the gas engine does not run. In my testing, I was often able to go 50+ miles (arguably, my first 8+ miles are down a long mountain grade, so that is why my range is higher than the EPA rated 35 miles) before the gas engine needed to start. If my daily drive was less than that 50 miles, I would not burn any gasoline at all. So, it is like an electric car like a Nissan Leaf? Not exactly. In a battery-only electric car like the Leaf, you can only go as far as the energy in the battery can sustain you. Once you have run out of electricity, you must re-charge. The downfall of this is the recharge time of a modern battery. Even with higher voltage 240V (level-2) charging, it will take hours to 'refill' the battery. Compare this against the sub-10 minute refill time of a gasoline powered car and you see that an electric is often limited to commuter car duty, and why some people have a problem buying into this technology - even if it would actually meet their needs. 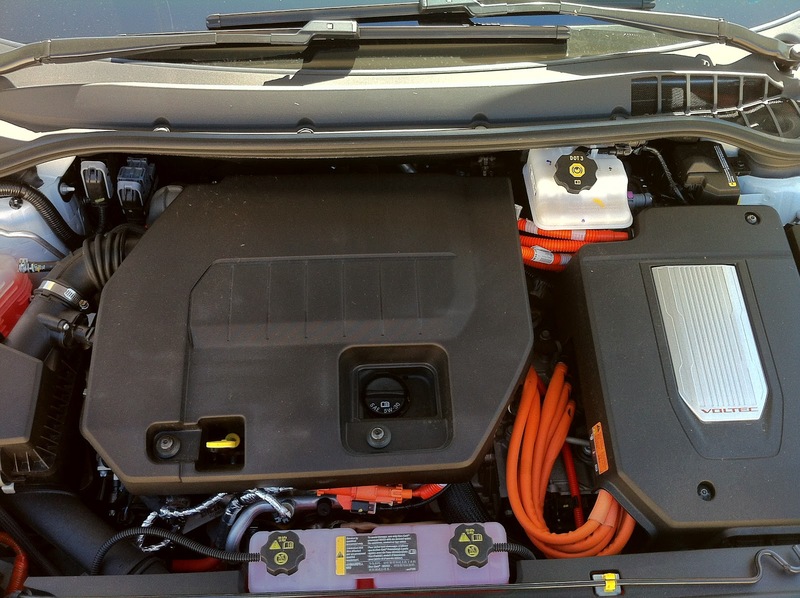 In a Volt, once the battery is depleted, a gas engine (1.4 liter 4-cylinder that runs on premium fuel) starts and runs an electrical generator. Power from this generator now becomes the input to the electric motors that propel the car. Since the engine/generator pair only put out the equivalent of 74hp, less than half the 150hp combined output of the electric motors, the Volt is actually slower in this mode than when the battery pack is being used. However, I found that even in this mode, the Volt could sustain 50-55mph up mountain grades and interstate speeds were no problem. This combination of battery with generator fall-back give the Volt a real-world advantage over both a traditional hybrid and a full-electric car. Efficiency in normal day-to-day driving is significantly better than a hybrid and for the occasional drive that exceeds your electric-only range, you just continue on as you always have in gasoline-powered cars of old. However, this dual-power trick the Volt attempts isn't without its own complexities. First of all, you are carrying both the electric propulsion items (motors, electronics, batteries) as well as all the parts you know from a conventional gasoline powered car (gas tank, engine, radiator). All of this brings weight and complexity (though not really more than you would get with a hybrid that also has a dual-power system). Secondly, because of the expected short time the gas engine would be used in day-to-day driving, the Volt carries only a small (9.3 gallons) tank of fuel. This provides a somewhat shorter range than a conventional gas-powered car. And, even with this small a tank, there needs to be logic built into the Volt that occasionally runs the engine to burn off fuel before it becomes 'stale' in the tank. The tank is also lightly pressurized to extend the life of the gasoline even further. Finally, there is the complexity that comes with carrying batteries. The Volt does have a fairly large battery pack. This pack is made of 288 individual lithium-ion cells similar to those found in modern portable electronics. The battery in a Volt has a total capacity of 16kWh, though you may have noticed that I only saw 10kWh of energy before the car switched to gas engine/range extended mode. This is because of an interesting little secret of lithium-ion batteries. Li-Ion really hates to be fully charged or fully discharged. Putting in as much power as it can hold or pulling all the power completely out reduces its lifespan greatly (which is why the battery in your cell phone dies a couple years after you bought it - portable electronics use the full capacity of the battery.) In an automotive application, a battery needs to live closer to 10 years. In order to get there, GM designed the Volt's battery to only use the middle of its capacity - they never fully charge or discharge the pack and, as a result, expect 70-90% of its new capacity to be retained after 10 years. Time will tell if this actually ends up to be true. One last piece of the efficiency game, the regenerative braking trick used by hybrids, etc., is also used here. So, slowing a Volt will put power back into the battery for later use. The 'gear' selector has settings for Park, Reverse, Neutral, Drive, and Low - Drive and Low are different only in the amount of regenerative braking they provide - Low is useful in steep grades and in stop and go traffic where more pronounced slowing is nice to have. In fact, during stop-and-go driving, I could often use Low to slow the car all the way down to 3-5 mph before touching the brake pedal. This technique, which was far from 'hypermiling', maximized the energy I reclaimed. So, as you can see, the Volt uses a combination of techniques and technologies to provide yet another take on the 'efficient car' game. It's downfalls are complexity, weight and cost of carrying dual power sources, and - strangely enough - the difficulty in explaining how this is different than a battery powered car or a hybrid. Call it an electric and that doesn't seem quite right. Call it a hybrid and that doesn't capture it either. Call it, like GM does, a Range-Extended Electric Vehicle - and you likely will get blank stares. But at least you know how it works now.